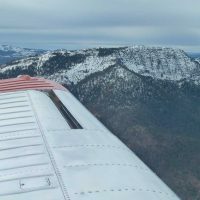 I received an email from a reader recently that asked a question about the weather services that I use when flying my Swift – both during my preflight planning and enroute. There are books written on aviation weather services. I have one on my desk by Gleim that incorporates both FAA AC 00-6A and AC 00-45G. I bought it to get ready to take an FAA test for the Ground Instructor ratings. I’m still working on that project. I don’t fly the Swift any great distances any more – at least I haven’t lately. The other Swift I had made trips back and forth across the country several times during the 35 years I owned it. Most of those trips were made back before handheld electronic devices were everywhere you looked. I remember reading the weather off of teletype machines in the Flight Service Stations at airport along the way. For several years I didn’t have a navigation radio of any kind in the plane. I used those old paper things called Sectionals and looked out the window. What a concept. Most of my early preflight weather research is done using TV weather for a broad outlook of where the weather systems are and where the meteorologists are guessing that they’ll go. The day before and the day of the trip I use AOPA’s Flight Planner to plot the route, print out a flight log and to get the weather, NOTAMS and weather charts through their integrated DUATS system. My enroute weather sources are usually listening to ATIS/AWOS broadcasts of airports I am flying over and occasional calls to Flight Watch for conditions farther away. 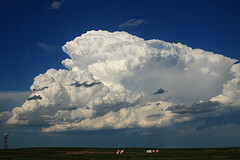 For more detailed weather in my area I look out the window. I still don’t have a navigation radio in my ‘new’ Swift. I’m back to navigating by looking out the window again and using a sectional chart. 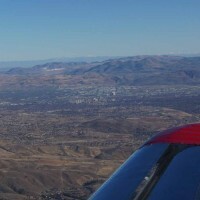 Most of my flying has been around and to the west of Reno. I’m very familiar with the area so the chart is a backup to my local area knowledge and for details on the airports enroute. I also carry the newest version of Flight Guide. 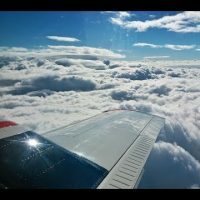 I have an instrument rating and lots of actual weather time, but I have no need to fly in less than VFR conditions any more. I land if I don’t like what I see by looking out the window. Whoever may be waiting for my arrival can wait a bit longer and there is no event I need to get to so badly that I need to fly in weather to get there. I have it on good authority that the earth will continue to rotate if I have to cancel or delay my plans. AOPA Flight Planner access to DUATS. If money was no object I’d have a nice flat panel cockpit and XM weather displaying on a big moving map. That’s not going to happen.